>Around the shop, I get a little guff because I like to knit toys. I find them enjoyable. They usually go quickly and you have something fun to have around or to give away. 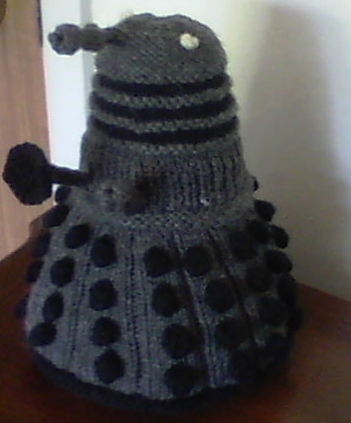 So, I knit a Dalek for my brother in law for his 40th birthday. Now many of you may not know of the Dalek race. That is okay. They look like this. 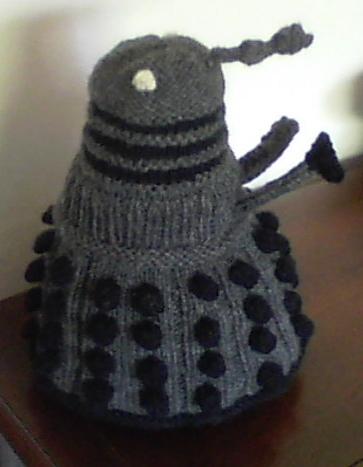 Anyway, I offered to knit something for my brother in law and my husband asked if I would knit him a Dalek. The pattern is called Extermaknit and I have known of it for a long time, but have not knit it for one very good reason: Bobbles. I hate bobbles. They are fiddly and they always sort of look like warts to me. Now this pattern has 58 bobbles – 58! That is an outrageous amount of bobbles to knit. The pattern does give you the option of using buttons, but I had to admit I liked the look of the bobbles better, plus finding 58 buttons to use and then sewing them did not seem any better. So I bit the bullet and knit a Dalek in two colors (like the old fashion Daleks) and I personally think it turned out pretty good. I suppose you are wondering why I am writing about this project. I have 2 reasons. 1. ) I had several choices in this project. I could knit the bobbles or I could put on buttons or pompoms or something else. Once I chose to do bobbles, I had to decide if I wanted to do them in one color (which would have been a lot quicker and easier or if I wanted to do two colors. I also had to choose which yarn to use. I decided to use Nature Spun Sport doubled because I had the right colors. Now I could have used it single and just had a much smaller Dalek, the one I did measures over 9”. Or I could have looked through my extensive stash and found some worsted or dk or bulky and used that and again had a different size Dalek. I will say one of the advantages to knitting toys is that you can make them out of any yarn, just go down one or two needles sizes from what is on the ball band. Now in reality we get to make choices in everything we knit. Just because a sweater pattern has ¾ length sleeves, doesn’t mean you have to knit them that way. Or if you are like me, you will make long sleeves into ¾ lengths because it is what I like to wear. If a pattern has bobbles, maybe you can replace them with something else. If you like a long vest pattern but would never wear a vest that long, stop knitting whenever you like. One of the best parts of knitting is that you can make any pattern yours. Experiment with your knitting and see what happens. 2.) This pattern was written by someone who had knit one hat and one scarf before tackling the formation of a Dalek pattern. She learned to do a lot of stuff while creating it, including bobbles. I think sometimes as knitters we get worried about being perfect and that scares us into not trying new things. As a knitter, I am always making mistakes. Sometimes I fix them and sometimes I don’t. I have had to rip out huge swathes of knitting because some dumb mistake I made. I have also ripped out things that I have almost finished because I just did not like how the end project was going to be. This is how it goes. Mistakes are a part of life and we always learn something from them. Do not be afraid to make them. Every year, I make a New Year’s resolution to learn a new knitting technique. This is a good way to keep learning and it is not too much pressure to know everything all at once. But I do think it is important to keep learning and to keep pushing my skills. Just think of this Dalek pattern when you are thinking something is too advanced or you could never do it. It is just knitting. The world will not end if you mess it up and who knows, maybe you will discover some new stitch or technique or a cool new pattern. We just received in some awesome yarn at the shop. 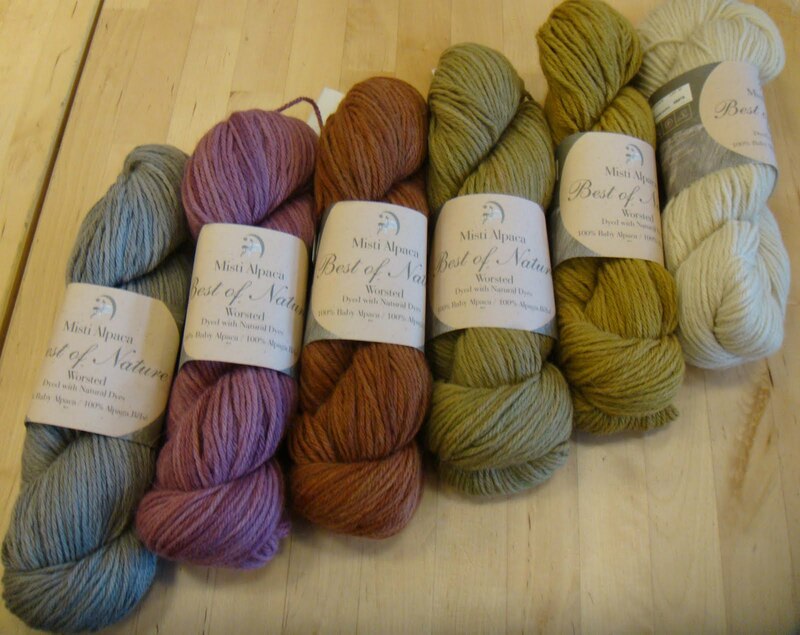 It is from Misti Alpaca and it is called Best of Nature. It is a worsted weight alpaca yarn and all of the colors are from natural dyes. Natural dyes are subtle and beautiful and they always go together. Come in and check out the lovely colors in person. Also, don’t forget we are having a sidewalk sale next weekend (15th – 18th).